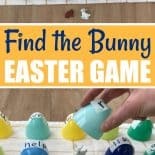 Get ready to have a hopping good time with this educational Easter game “Find the Bunny”! 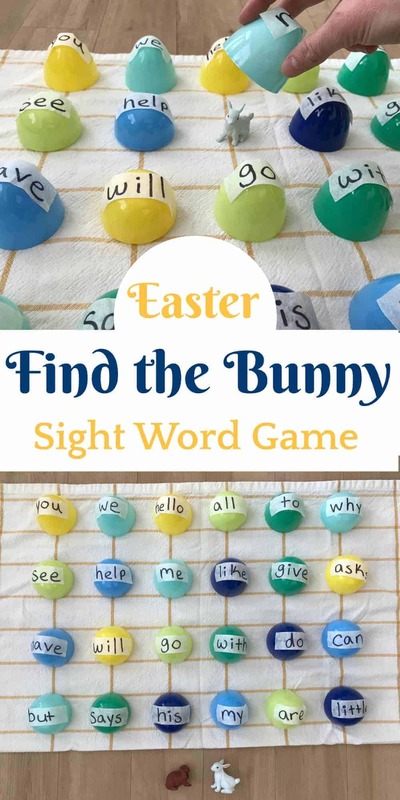 This easy DIY Easter game features large and colorful plastic Easter eggs with customizable and interchangeable sight words, teaching kids how to read — in a way that also lets them have fun! If your child is like mine, they would rather do ANYTHING than work on their reading list. Never mind that my oldest loves to look at books and read them with me…he just has ZERO interest in actually learning to read himself. That’s where this colorful game comes into play! 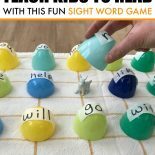 This is a game that actually makes learning to read fun for your child! 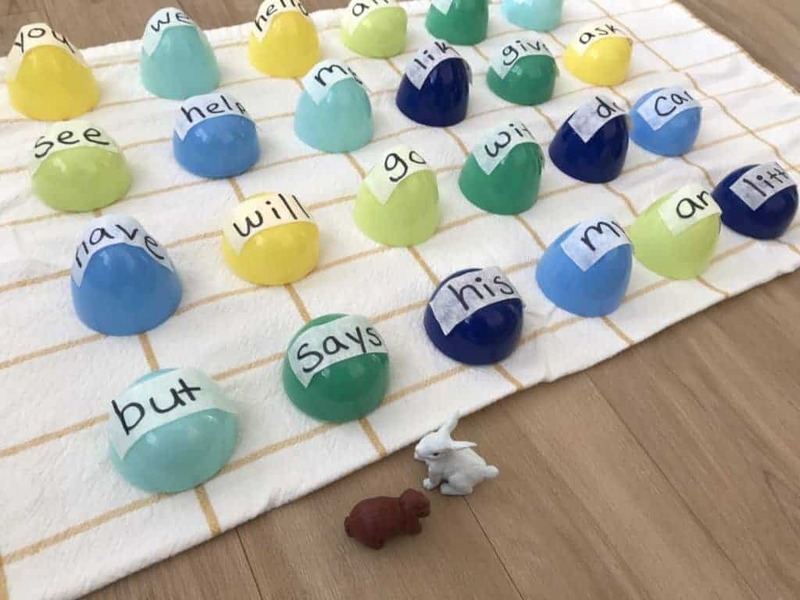 This game is created in such a way that it allows you to customize it to your own child’s needs; it also allows you the flexibility to easily change words in the future. This isn’t a “use-once-then-toss” craft! Regarding the bunny, don’t feel limited to using only a bunny! You could use any small creature you have around your house (chicks, butterflies, you could even use a cotton ball and say it’s a raindrop…work that imagination). 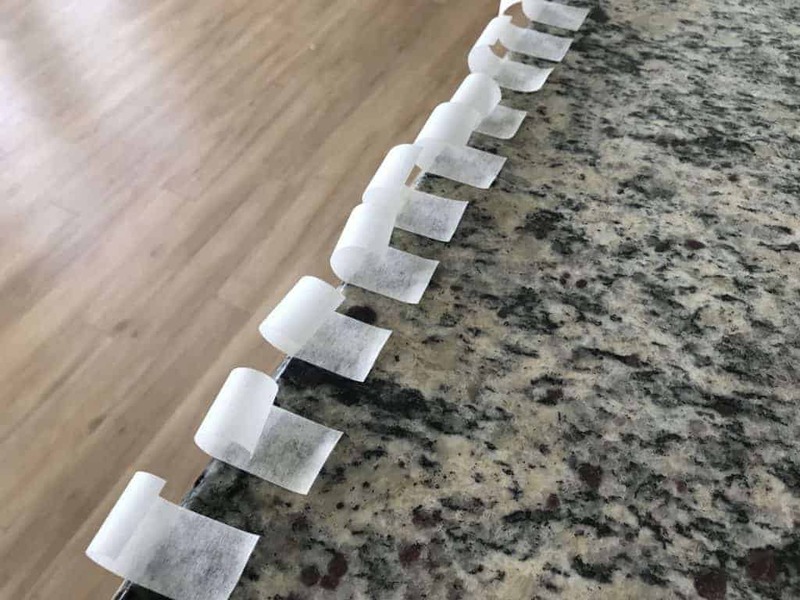 First, take the painters tape and cut 24 small strips, approximately 1.5 – 2 inches long. It doesn’t have to be perfect, so don’t try and measure each one, just cut them out. I placed the tape on my counter first, pulled it out, then cut it like so. Next, take your painters tape strips and place them on the plastic binder divider. This will allow you to easily write out the words! I put twelve on the front and twelve on the back. *Bonus: once you are finished with the game, you can place the tape back in the binder to store for later use! 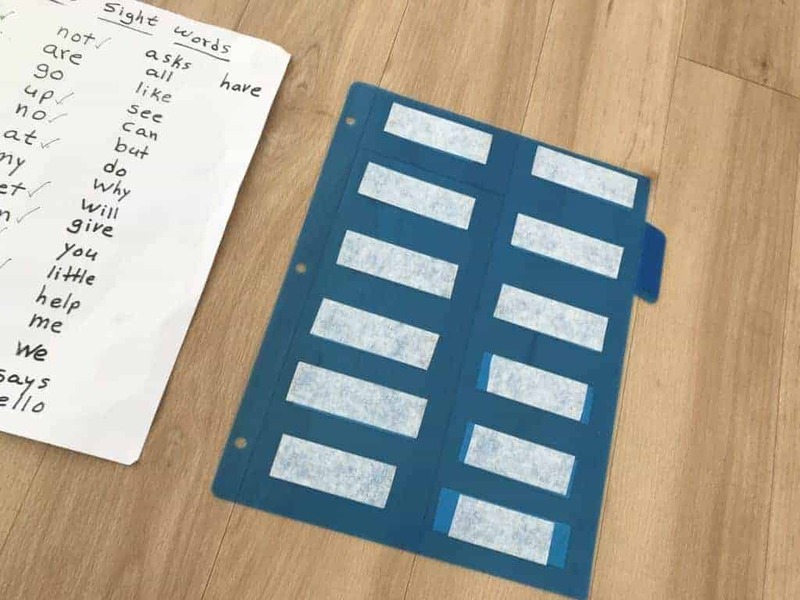 Now, that you have placed the tape strips on the plastic sheet, take your Sharpie marker and write out the sight words. We worked on our daily reading words, but you could also use Easter vocabulary (egg, bunny, flower, etc). Once you have all of your words written out, gently take the eggs apart and begin placing the word strips on top of your eggs. I did this for all 12 of the egg halves, totalling 24 words on the Easter eggs for this game. 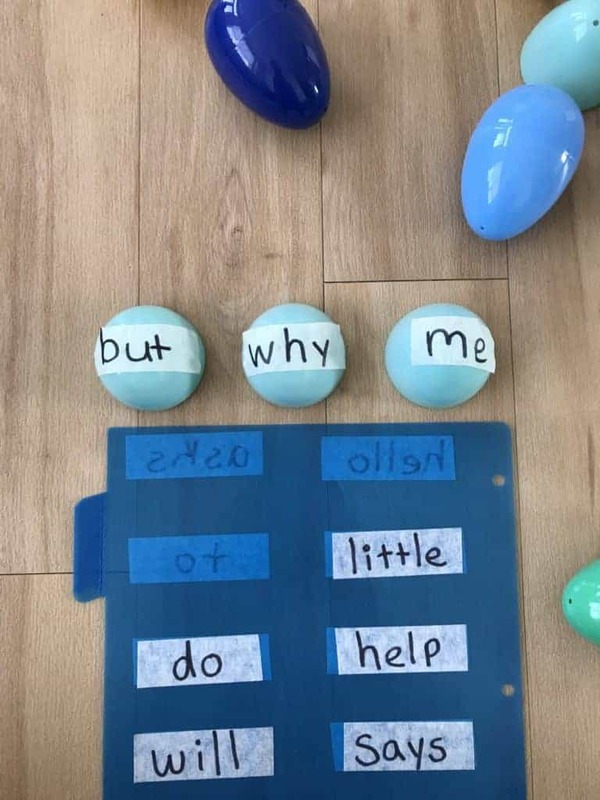 After you have finished placing all the tape strips on top of the eggs, now you are ready to lay out the eggs for the word search. I placed mine on top of a towel, but you could also just put them on the floor or the table top. Tell your child/children to cover their eyes. Replace the egg on top of the bunny. Tell your child to uncover their eyes. VERBALLY tell them which word the bunny is hiding underneath. Allow them ample time to look at all the words. You can repeat the word slowly for them if they need a little help. It’s ok if they pick the wrong answer, just allow them to try again. Rejoice when they find the bunny! UPDATE: If you like “Find the Bunny”, you will love this follow-up with 5 more fun and educational Easter egg games! Very cute idea! I’m sure little ones will love doing this! Thanks, I can’t wait to play it WITH them XD. What a great game and I so love how you incorporated the colorful Easter eggs! Thanks so much for sharing your awesome post at our Friday Friends Parade Linky Party! Janine, thanks so much…glad you liked it 🙂 I look forward to seeing more at your Friday Friends Parade in the future!